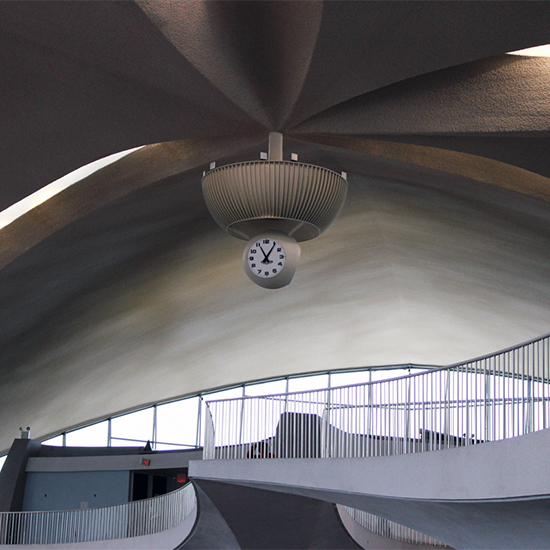 Few paragons of architecture are more exalted and less accessible than Eero Saarinen’s Trans World Airlines (TWA) Flight Center at John F. Kennedy Airport. Today, passage via the vermilion-carpeted gateways—which now lead from Jet Blue’s Terminal 5—is generally possible only during Open House New York, and this year marked the Flight Center’s last public opening before undergoing major renovations. Last weekend, we hopped a Howard Beach-bound A train for one last chance to experience this sublime offering to the gods of the Jet Age in its original form. Completed in 1962, the TWA Flight Center was one of a family of terminal buildings constructed by individual airlines to populate architect Wallace Harrison’s masterplan for New York’s second airport in Queens, then known as Idlewild. Its sisters included Mid-Century modern gems such as Pan-Am’s Worldport, American Airlines’ Terminal 8—which featured the largest investiture of stained glass in the world—and I.M. Pei’s Sundrome. Of these, only Terminal 2, with its mushroom-like concrete columns, survives. The others have since been unceremoniously demolished by airlines facing radically altered business in the intervening decades. Saarinen designed the Flight Center with an emphasis on views to the surrounding runways and taxiways. Wherever one sat sipping a martini or smoking a cigarette, there was a sweeping vista of planes arriving from and departing for destinations around the globe. Rather than contemplating symbolism within, as in a church, this cathedral to the marvel of flight encouraged the worshipper to behold mankind’s technical prowess, on display in every direction outside. Unfortunately, subsequent construction at the airport supplanted the inspirational views with visions of parking structures and terminals of significantly inferior design, but the beautiful, sweeping forms forged by Saarinen in reinforced concrete leave nothing to be desired for the visitor admiring the beauty around him. On our visit, we walked the gleaming penny-tiled floors of the TWA Flight Center and basked in the muted sunlight filtering in between the trussed window mullions. The atmosphere inside recalled a time when international travel was associated with the glamorous jet set and unimpeded optimism, an era before invasive security screening and the threat of contagious disease irrevocably altered our perception of hopping between time zones. Passengers arriving at the Flight Center during its heydey in the 1960s and ’70s were welcomed at the check-in desk—which grows organically out of the floor, along with the ovoid and still-functioning departures board that hovers above it—by beaming TWA employees in meticulously tailored uniforms, the click of whose heels one can still hear echoing off the marble steps leading gracefully upward to the first class lounge and its Noguchi fountain (currently awaiting restoration). Coach passengers could ascend the southern stair or cross the gracefully bowed footbridge to the Paris Cafe for a pre-flight meal, or stop by the Lisbon Lounge, where they would be served by tuxedoed waiters balancing cocktails on gleaming trays. The Vulcain clock suspended above the sunken, red fabric-covered waiting area seems still to encourage passengers to order one last Manhattan before dashing down the gateway. Upon TWA’s bankruptcy in 2001, the Flight Center was deemed insufficient for the requirements of modern air travel, with its skyrocketing number of passengers and the extensive security screening required after 9/11—considerations Saarinen couldn’t have foreseen when he began designing the terminal in 1956. Fortunately, New York City had designated both its exterior and interior spaces a historic landmark in 1994, precluding its demolition. It sat vacant until 2005, when construction began on the neighboring T5, by which time it had also been added to the National Register of Historic Places. Today, the Flight Center awaits transformation as part of a proposed airport hotel, which would utilize its spaces for a lobby and concessions. We look forward to the opportunity to once again raise a glass to the marvel of flight underneath its soaring vaults.